However, with the ElectroGravity model we can show how all cosmic bodies will be electrogravitic and draw other negatively charged bodies and even neutral masses without charges (from Electro-Gravity field divergence effects) towards itself. All cosmic masses will push positively charged (ionized) matter out and away, and pull ordinary matter (Gravity) towards the center. Everything reaches a balance between ElectroGravity dielectric effects and Electrostatic push and pulls. This is why the planetary orbits – and even atomic electrons do not collapse into the center – because there is an equal force of push and pull between ElectroGravity (both dielectric and electric) and normal Electrostatic charge effects. 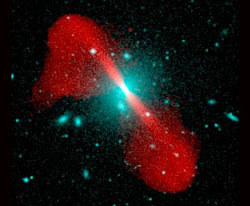 Near the center of the galaxy you may also see jets of positively charged matter being pushed out along the axis of rotation. This is because in a disk of rotating charge there is a much smaller divergent ElectroGravity field (that we in the past have called Gravity) on the axis of rotation. Yet the ElectroGravity field is extremely strong and pushes positively charged matter out and beyond the galaxy. See the real example picture of the galaxy above.